The world of speaker docks sometimes seems like Apple-only territory, but iLuv is branching out to serve the needs of Android tablet users as well. 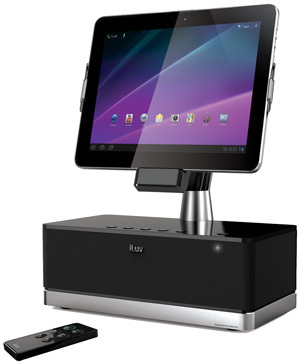 The iLuv MobiDock ($69.99) is the first speaker dock available for owners of the Kindle Fire tablet. A set of flexible arms holds the Kindle securely in place while it charges via the bottom microUSB connector. The Kindle’s standard 3.5mm audio jack is used for the audio connection, which means you can plug just about any device into the dock in a pinch. Given the price, you don’t expect a premium audio experience, but in fact sound quality was perfectly acceptable, particularly from a compact system, and the design is simple and attractive. All in all, a nice way to listen to music, audiobooks, or movie soundtracks while watching hands-free. 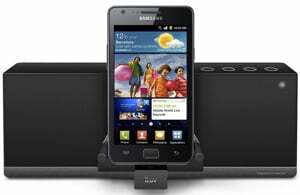 Another first from iLuv, the ArtStation Pro is the first audio dock for Samsung’s Galaxy Tab. This is a more substantial speaker system, clear and easily heard even on a noisy trade show floor, with substantial bass response. A raised cradle holds the Galaxy Tab while charging, with the option to rotate into portrait or landscape position. The ArtStation Pro includes a wireless remote control, handy for changing volume or skipping through a playlist. And in a nice touch, the remote attaches magnetically to the base unit when not in use. Compatible with the 7-inch, 7.7-inch, 8.9-inch and 10.1-inch Galaxy Tab models, the ArtStation Pro sells for $149.99.